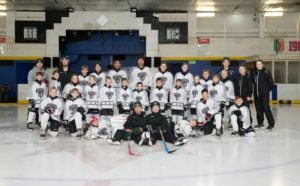 26 young ice hockey players have just spent a gruelling week on Bradford Bulldogs’ annual ice hockey camp, to develop and improve their skills in preparation for the new season. The young people, aged from 6 to 14 clocked up over 40 hours training at Bradford Ice Arena, where they worked on the ice on their skating, puck handling and team work skills and off the ice at the University Gym, where they strove to improve their fitness levels and knowledge of game strategy. Two of the older Bulldogs players, Harrison Walker and Jordan Griffin plus Kieran Brown (who recently gained an apprenticeship with Sheffield Steelers), volunteered their time to boost the coaching team and thoroughly enjoyed their new roles. Andy Brown, Head Coach said ‘Our annual hockey camp is popular and well attended. We seek to develop the players both on and off the ice and our commitment to player development is reflected our winning the EIHA Award for Development for the past two years’. All players trained extremely hard and we hope this is reflected in our games, next season’. Bradford Bulldogs Ice Hockey Club runs a Stick and Puck Session every Wednesday, for players aged 6 up to 14. Players need to be able to skate without holding onto the edge. A helmet and stick is provided and skate loan is available for the first few weeks. The session costs £4.00 and starts at 5:15pm, concluding at 6:15. For further information, contact Andy Brown on Tel 07976 931842, email andy@icetime.org, or, just come down to the rink at 5.15pm on Wednesday! Bradford Bulldogs Ice Hockey Club is celebrating as its U13s team has won the league for the second year running and is now set to take on the best teams from the South for the chance to be crowned the English Ice Hockey Association’s National Champions. 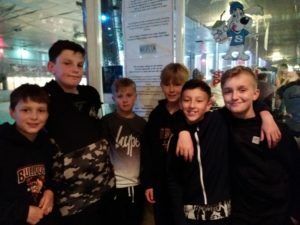 The U13s team beat off strong competition from the ten teams which make up the top tier of junior ice hockey such as Sheffield, Nottingham, Coventry and Hull to become the Northern champions. 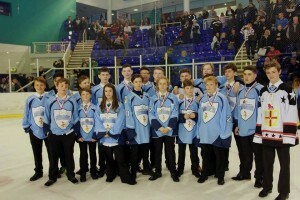 Bradford Bulldogs U15s Team will also be fighting for National Champion status as a League runner up. Head Coach Andy Brown said ‘The Bulldogs have had another fantastic year and we are hoping that both teams successfully defend their title. I am very proud of all the players in the Club, who have trained hard all season to achieve their goals’. 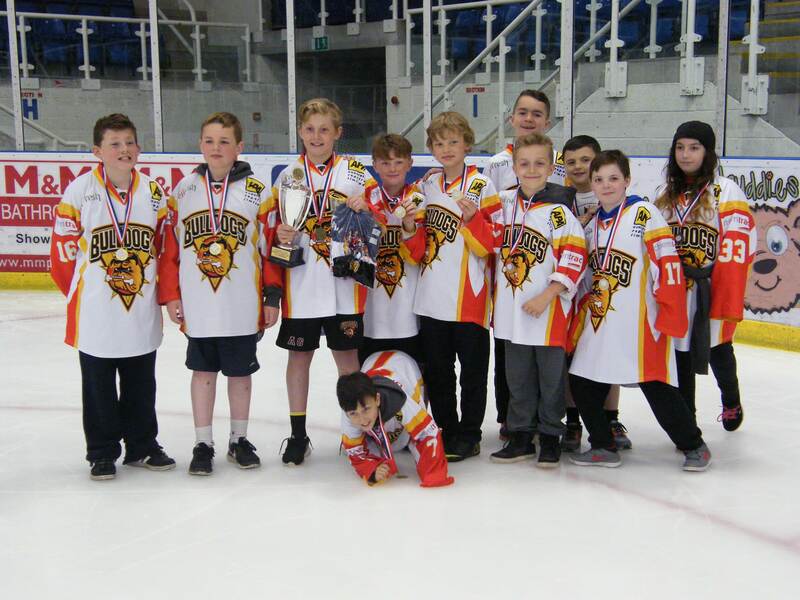 The Club, which this season won the EIHA Development Award for the second year running and the Young Club/Team category in the Bradford Sports Awards, hopes the success of the teams will attract more children to play ice hockey. It is particularly looking for players for its Under 11s and Under 13s team. Having your Dundee cake and eating it!!! 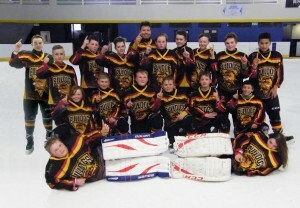 Bradford Bulldogs Under 12s ice hockey team has scored a hat trick by winning the Dundee Stars Spring Classic tournament. On the wings of winning the Nationals, the team travelled up to Dundee, at the weekend, to take on the top junior teams from across the British Isles; Dundee, Fife, Edinburgh, Cardiff and Belfast. In a continuation of their winning streak, the mighty bulldogs beat all five teams over the course of the weekend, to face Dundee in the finals. Despite having only 11 players against 23 from Dundee, Bradford played a closely contested game to emerge winners with a final score of 4-1. In addition to their fantastic win, the Bulldogs players received commendations about their behaviour, attitude and professionalism from the Conference organisers, who said they were a credit to their club and the City of Bradford. 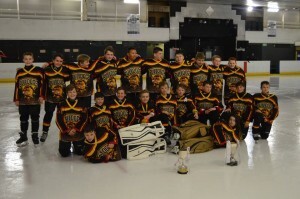 Bulldogs Ice Hockey Club has scored a first for Bradford, as not one but two of its teams have been crowned the English Ice Hockey Association’s National Champions 2015. Bradford was represented in all three age groups (u12s, u14s & u16s) at the EIHA’s Junior National Finals held in Sheffield over the weekend of 16th & 17th May, for the first time in the clubs 40+ year history. The event saw the top placed teams in the North play against the second placed team in the South and vice versa in the semi-finals on the Saturday, with the winners playing off the following day for the title of National Champions. On the first day, Bradford u12s saw off tough opposition from Bracknell in their 12 – 5 semi-final win, while the u14s beat Slough 6-1 in a clinical display of hockey. Despite a valiant effort, the u16s couldn’t make it three wins for the Club, as they went down 3-1 to the Okanagan Hockey Academy, which is a North American ice hockey academy based in Swindon. The finals on Sunday gave the Bulldogs a chance to make further history and become the first team from Bradford to become national champions. The u12s played first and despite falling behind to an early goal, the team battled back and took control to beat Guildford 6-2 to become Bradford’s first National Champions. The next final was a much closer game as the u14s also took on Guildford and were trailing 4-3 with just five minutes to play. In true Bulldogs spirit the team rallied and produced a thrilling comeback to eventually win 7-5 and become Bradford’s second National Champions. Head Coach Andy Brown said “We are only a small club but all the hard work from players, coaches and the support of parents has paid off. We have only ever had two teams reach the national finals in the history of our club and we have never won; to have this victory for two of our teams is a fantastic achievement for the Club and for the City of Bradford. I am very proud of all the players, as they have put their hearts and souls into this season”.